Stephen Bennett in action for Waterford. 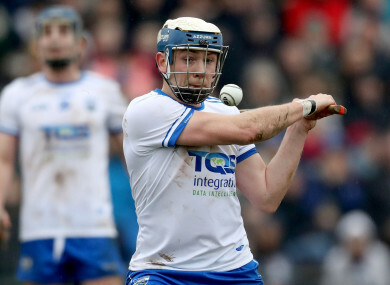 STEPHEN BENNETT HELPED himself to 0-12 and Patrick Curran and Thomas Ryan got two goals apiece as Waterford eased to a big win over Laois in O’Moore Park this afternoon. Having seen off Offaly by 27 point last weekend this was another stroll for Paraic Fanning’s men who led 2-12 to 0-5 at the break despite playing against the breeze. A seventh minute goal from Patrick Curran set Waterford on their way and with Bennett unerring from frees, they led 1-9 to 0-2 after 24 minutes. Laois rallied briefly with points from half backs Ryan Mullaney and Sean Downey but a brilliant Thomas Ryan goal had helped Waterford to a 13-point lead at the interval. Things got even worse for Laois on the restart as half-time sub Lee Cleere was given a straight red card for an off-the-ball incident involving Thomas Ryan. But the result was never in doubt and late goals from Curran and Ryan – with Kavanagh responding with a cracker for Laois – ensured Waterford had 16 points to spare at the final whistle. Email “Bennett leads the line with 0-12 as Deise easily see off Laois by 16 points ”. Feedback on “Bennett leads the line with 0-12 as Deise easily see off Laois by 16 points ”.